OK, so let’s be honest, whether you’re a blogger or not, we’re all forever looking for ways to grow our social followings. Like hey, we could be using that energy and brain space for something productive and life-changing like exercise or saving baby foxes, but whatcha gonna do, Instagram obsession just comes as a given as a twenty-something in 2015. I’m on a bit of an Insta roll at the moment, after writing that post on how it’s good for us last week. I was actually surprised at how many people were like YES, THIS. As sad as our obsessions with photographing our lives for the internet are, we have to look at the good side of it otherwise we might just implode and splatter glitter and Amaro filter and coffee and avocado all over the walls, and ain’t nobody want that. So I thought I’d let you into a few Insta secrets. And when I say secrets I mean not really secrets at all, just things. I’d let you know where and when I’ve noticed my followers jump up in the hope that it might help a girl out. ‘Cos let’s face it, ain’t nothing (aside from Dominos stuffed crust and a bottle of Prosecco) that gives your day a little boost than a handful of new followers. I’m cringing as I write this. I hate the world and me and the internet and society, but if you can’t beat it than you might as well join it. HERE’S TO HITTING OUR INSTA MILESTONES BY CHRISTMAS. lol. If you follow me on ins to the gram (I’m over here just FYI) you might have noticed I did a birthday giveaway back in September. In order to enter all you had to do was follow me and like the photo of my giveaway (an arty pile of beauty products and postcards bascs) and then for an extra entry you could regram. I had the competition open for a week, and jumped up nearly 1,000 followers. I’m for real. Now, several things. Firstly, you can’t just go whacking up a comp a week because it cheapens your brand a bit as a blogger – you’ll become known as a giveaway site rather than a sassy, cool kinda site and ain’t nobody want that. And secondly, it’s down to having a bit of a following to begin with and making sure you’re promoting it across you other channels like Twitter and Facebook and your good ol’ blog. And finally, it’s about making sure it’s a good giveaway with things people actually want and having it displayed in a way which is damn sweet on the eye. Giving away 12 bottles of moisturiser ain’t gonna get your followers shooting up – but doing a well targeted Christmas or birthday giveaway might just. Also, it’s worth noting that my giveaway wasn’t sponsored by any brands and I always find that helps with people’s likeliness to get involved. Whenever I’ve been part of something that has big bloggers and YouTubers involved – and there’s a hashtag, I get a swarm of new followers. Two good examples of this were the #EtsyBloggerSleepover back in August and the #ITrekHere trip to the Wild West back in June. You don’t necessarily have to have people with way bigger followings than you tagging you in things – it’s likely their followers will click onto the hashtags they use to find out more about what they’re doing and who they’re with (don’t pretend you haven’t done this too – I could basically list entire guest lists for some events…). What I’m saying is, use hashtags. If you’re at a blogging event or you’re trialling a product that has a campaign and hashtag behind it, use it, because you never know who else is using it and who else is looking for similar people to follow. Now obvs if you get tagged by someone with like 75485678436 followers you’ll get a little bump up. It makes me lol that if I tag Rudey, she gets a handful of new followers and if I tag Chris he only gets one new follower on a really, really good day. Bless ‘im. Obviously getting tagged by a celeb or fellow blogger is ace and that, but another great way to do this is to get tagged by brands. Yuh huh. Whenever you upload an outfit post or ANYTHING WITH CLOTHES AND BEAUTY AND ITEMS IN IT, tag it. I’ve been regrammed a fair few times, but by far my most successful regram was the time Miss Selfridge regrammed my #FWIS, which featured a croissant, a coffee, some random sandals, and part of a seriously old Miss Selfridge leather skirt. I think I had 50 new gal pals within the hour. If you don’t tag brands, they won’t see your seriously sassy photos and they won’t regram you. TAG TAG TAG. I always thought it was enough having my Instagram icon at the top of my sidebar and having an Instagram widget further down, but nope. As soon as my new blog design went live a few weeks back, with that incredible bar of Instagram photos at the bottom, new followers started coming through noticeably quicker than before. Might have been a coincidance but I think otherwise. I think it works particularly well because it is so visual and humans are naturally incredibly visual animals. So saying ‘you can follow me here’ is gonna do nothing compared to HERE’S MY INSTAGRAM GRID TAKING OVER MY ENTIRE SCREEN. Know what I mean? 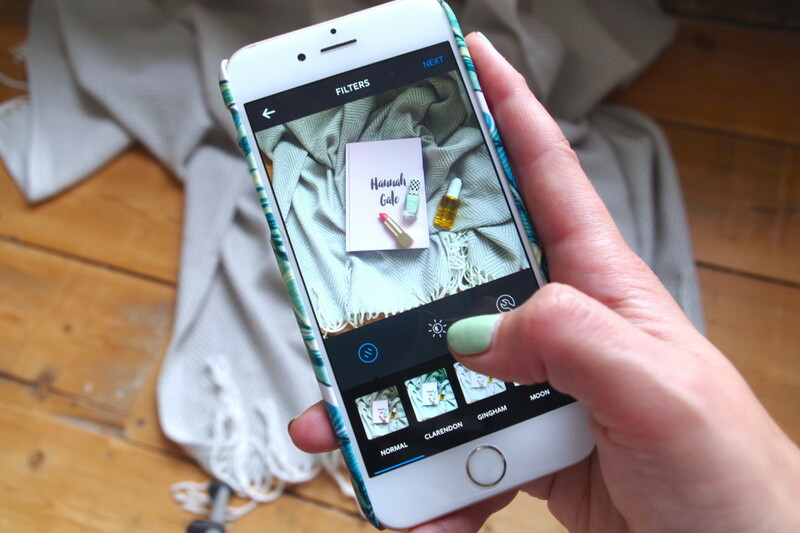 If you’re thinking of going for a re-design, make sure it’s clean and easy to use and you’re making space to show off your Insta snaps – it’ll instantly add colour to a white theme, so it really pulls together the whole blog look.